Most of the architectural lighting done today is performed through the use of in-ground or directional up lighting or wall grazing. While this is probably the most effective type of architectural illumination for highlighting gables and rooflines, it is not our only option. Very often, there are circumstances we are presented with that will dictate the use of down lighting. When I speak of down lighting in architectural situations, I’m referring to the use of luminaires placed within the soffits of a structure pointing down. Here are a few examples of situations where down lighting may be considered for use in place of up lighting. One of the largest factors that may cause our designers to consider down lighting instead of up lighting, is that of large, or overgrown plant material and hedging at the foundation of the architecture. Sometimes it is downright impossible to place lights right where you need them to be, simply because a small tree or a shrub is sitting right where you need to place a light fixture. A little bit of leaf and branch shadowing from plant material is perfectly acceptable to splash up on the walls, and in fact, often results in an interesting effect. Also, if you’re wanting to silhouette plant forms against a wall, up lighting from the base of the architecture is definitely the way to go here. However, if we find that the plant material is simply just too dense, we may consider down lighting from above it. This will allow us to light these architectural details without having to worry about conflicting plant material. An added benefit with down lighting is that it will allow us to also illuminate the plant material at the foundation of the home quite well too. This is great for “grounding” the architectural lighting into the scene so that it doesn’t feel like it’s floating in open space above a dark landscape. 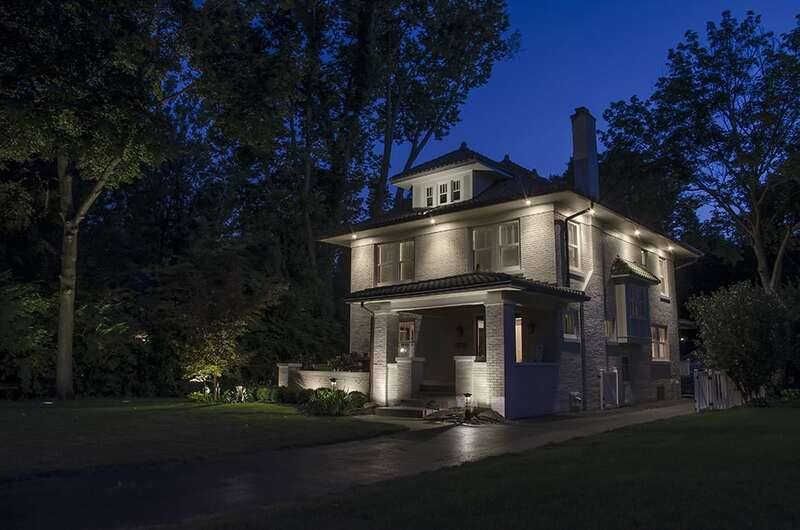 It’s always a good idea to have a visually smooth transition from the home down into the landscape with your lighting. We always strive to “connect” the home visually with the surrounding landscape to create a balanced lighting scene and allow your eye to move freely from one area to the other without straining. In the past, I’ve intentionally placed lights in soffit areas to down light trees that were placed near the foundation of the home. In these instances, I wanted the light to filter down through the canopy of the trees and create a nice broadcast of leafy shadow patterns on the ground underneath it. This was a really cool effect with the bright flowers that were planted underneath the tree. It was just a beautiful, soft, dappled light filtering through the trees. I’ve also used recessed down lighting intentionally to illuminate colorful, potted flower arrangements or window box plantings from above. Our clients will often invest a lot of time and money into creating beautiful planters with bright flowers, bold leaf forms, and trailing vines. It is nearly impossible to illuminate these potted plantings effectively from below, especially in very large pots and window boxes. Lighting these plantings from above will give a much more even illumination on the flowers and plant forms themselves, and it will create stunning shadows on the ground. As designers, we strive to be looking at the whole “visual picture” of the landscape and not just the architecture. There has to be a balance between architectural lighting and the lighting in the landscape. We look for opportunities to be creative with our light sources and look for opportunities where unique light placements will cause unusual and dramatic effects. Another great function of down lighting from soffits is that it will provide greater security for our clients through the effect of passive security lighting. Typically, you would see path lights or small wash lights being used to illuminate the areas down around the base of the home where windows and doors are placed. Down lighting from the home’s soffits will effectively illuminate all the areas around the base of the walls and doorways, eliminating hiding spots for potential intruders. A single recessed light placed over a back door does an incredible job of discouraging this as a potential entry point for an intruder that desires to remain unseen. Also, if our client has a back stoop, or steps off of their backdoor, these recessed lights do an incredibly effective job at illuminating many of the potential tripping hazards found with un-level surfaces. A lot of the older homes we encounter have little to no lighting outside of their garage. Placing recessed can lights in the soffits above the garage doors provides wonderful illumination for visiting guests, unloading groceries, or for just simply navigating your way around the home. As lighting designers, it is our job to consider all the variations that can be done with lighting to achieve the best solutions for aesthetics coupled with usability on the site for our clients.